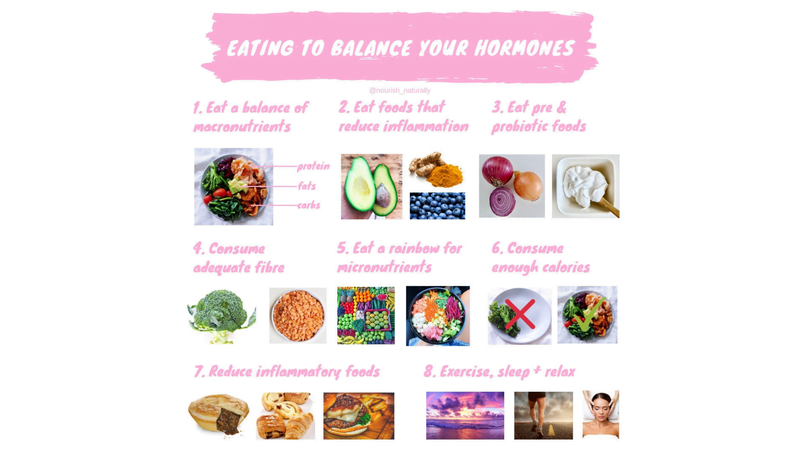 Eating to balance your hormones has been the most requested topic for me to write on this month! So here are 7 ways you can eat to balance your hormones. Protein, carbohydrates and fats, aka your macronutrients, are all essential for hormone production, hormone health and metabolic functions. Any diet that significantly restricts or eliminated any of your macronutrients can cause serious hormonal imbalances. A diet rich in foods that reduce inflammation in the body can help keep your hormones functioning properly. Anti-inflammatory foods include garlic, avocado, berries, tomatoes, ginger, olive oil and oily fish. For a full list of anti-inflammatory foods and how they work, click here. A healthy functioning gut is essential for healthy hormone production. Pre and probiotics help support a healthy gut. Probiotics are the ‘good’ bacteria in our gut and prebiotics is the fibre that the probiotics feed on, helping them to multiply. Prebiotic foods include bananas, onion, garlic, asparagus and beans. Probiotic foods include yoghurt, miso, tempeh and sourdough bread. Fibre is important to help balance hormones like insulin when you eat & help keep your gut healthy, which in turn helps your hormone functioning. In Australia, it’s recommended that adults consume 25-30g fibre/day. High fibre foods include vegetables, fruit, grains, nuts, seeds and legumes. For more info on fibre & how to meet your requirements, click here. Vitamins and minerals, aka your micronutrients, are needed to help support the glands in your body that produce hormones. Your pituitary gland, for example, which produces endorphins, oxytocin, prolactin, growth hormone, needs iodine, iron, magnesium and manganese. Eating a rainbow of foods will help ensure you meet your micronutrient requirements. If you don’t consume enough calories / kilojoules / energy, your body can’t produce hormones and you will experience hormonal imbalances. Be aware of fad diets and restrictive eating plans that could impact your hormones. Chronic inflammation impacts hormone production and hormone balance. Foods that can create inflammation in our bodies that should avoided include deep-fried foods, processed meats, sugary soft-drinks & refined carbohydrates. To learn more about inflammatory foods, click here.